A simple face made from a piece of fabric stretched on a frame. 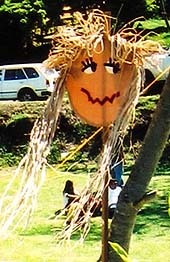 The face of this scarecrow featured a set of fancy dress spectacles with multicoloured feathers. 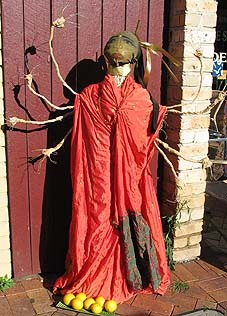 This large 'tin man' scarecrow was made from lengths of flexible pipe and tubing. 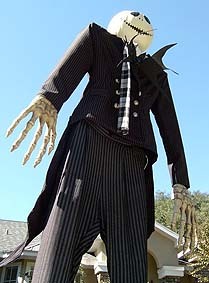 Jack Skellington scarecrow from 'The Nightmare Before Christmas' and his dog, Zero, were the creations of talented scarecrow-maker, 'Suz Great Ideas' of Ocala, Florida, USA in 2006. 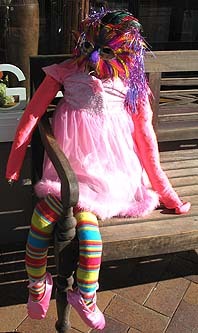 Note: This page includes novelty scarecrow ideas for you and your kids to make with an artistic style: colorful fancy dress scare crows, and unusual scarcrows made from novel materials.